Uranium prices on the increase! The spot uranium market - the market for immediate delivery of uranium - is currently relatively small and illiquid. Uranium is priced and traded as an ‘oxide’ – it’s a yellow powder, often referred to as “yellowcake”. Most uranium used in the world is contracted under long-term supply deals; the spot market typically accounts for roughly 10 to 20 percent of total volumes consumed each year. Nonetheless, spot uranium prices are a good gauge of general sentiment surrounding the prospects for nuclear power and uranium supply and demand. 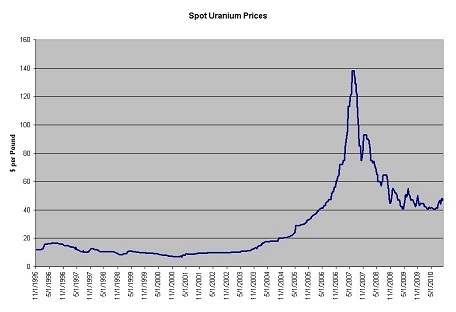 Here’s a graph of uranium prices since 1995. Since then uranium spot prices pulled back sharply, taking with it many companies associated with uranium, with the price hitting a low of $40.50 per pound in April 2010. Importantly, however, uranium spot prices didn’t fall back to the previous multi-decade $10 range, instead a new "floor" formed in the $40 - $50 range during the Summer and early Autumn 2010, with uranium spot prices as high as $48 per pound, earlier in September. The recent emergence of new buying interest has provided substantial upward momentum to the spot uranium price during October, with TradeTech's exchange value for October 31 rising by $5.25 to $52.00 per pound, an 11 percent increase from the September 30 value. This is the largest increase in the exchange value since November 2008. Recently it hit a two-year high of $60.50. Follow the change in weekly spot prices of uranium (Ux U308). How to benefit from fluctating uranium prices? The spot price of uranium is once again slowly trending higher. However, according to many 'industry insiders' not fast or far enough in order to stimulate any new supply. Apparently, it will have to increase a lot further to help overcome the looming shortfall in uranium which is expected in earnest as from 2014. Click Here for information on how to benefit from fluctuating uranium spot prices. The 'insiders' believe that the current uranium price is just too low to spur new supply to meet further reactor needs. Some say that the uranium price needs to be at least $75 per pound to generate the returns needed to incentivise the opening of new uranium mines and additional production. The current uranium miners, and most of the near term producers, are (relatively) known entities. To get new uranium supply ready by 2014 and onwards, when a number of new nuclear power plants are expected to come online, electricity producers and utility buyers alike need to secure proven reserves of high grade uranium now. However, securing funding and the construction of an uranium mine, with specialist processing facilities, often takes a number of years, prior to mining actually starting. Extract Resources, 41% owned by AIM-listed Kalahari Minerals Plc. This group of junior uranium miners will increasingly be of interest to longer term investors, as well as established major uranium (-related) or non-uranium miners (who decide to enter uranium mining), as well as integrated mining and reactors builders and utitlities whom all may view them as potential acquisition targets. Click Here for information on how to benefit from increasing uranium spot prices.